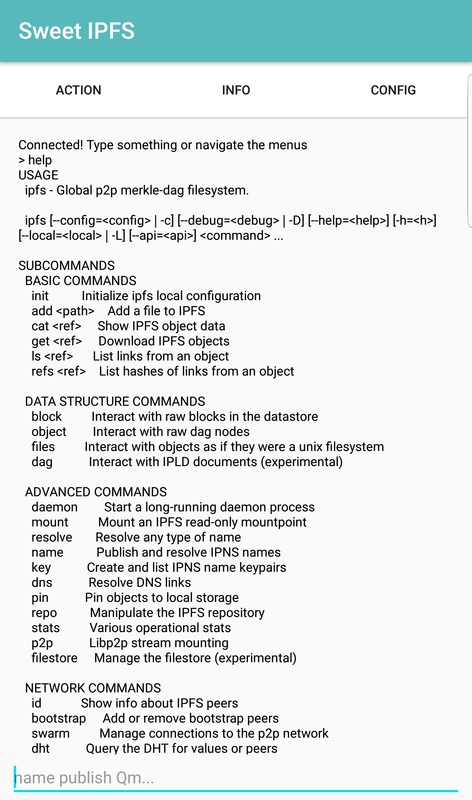 Sweet IPFS is a fork of IPFSDroid that aims end-user and developers usage. What are the specs? I mean memory usage, network usage? This will be extremely useful for p2p apps. However I wouldn't invest much time into the UI. Instead what I think is really needed is a Java lib that can run an IPFS node in mobile-friendly mode. You can take this idea even further and wrap this into a React Native module. How do I set this up to "mirror" my IPFS site? Name publish does not seem to be the way because of the separate PeerID. but nothing prints out on the screen. This will be a great tool. I'm using my phone as a wifi hot spot, and the ipfs on my mac used up all of my 8GB quota for hotspot data in less than two days. Apps on my phone don't count against the quota, so I'll sleep better knowing my site doesn't go down, which would be embarrassing since its purpose is to extol hosting sites on IPFS as an almost bullet-proof poor man's solution. I invite any kindred spirits to pin my site --it's less than 12 MiB. hmm. Did you mean the IPNS name hash? I tried that command using my name hash, both on sweet and on my mac, where the repo is. No result, either way. I just tried using the parent hash of the most recent version. This works, but it means I will have to unpin it with each new version and pin the newest version. Is there a way to do this with the name hash? No, there is no such way for the moment. Simplify, speed up, and secure access to the InterPlanetary File System (IPFS). How to shut off Sweet IPFS? I tried just 'x'ing it in the taskbar. At this time, it sometimes is too much on my battery. I don't think the correct way is working. After "killing" from the task switcher, the phone remains hot, notification interface remains active, battery life is short, and 15% warning is really zero warning. Sweet IPFS 0.2 is now available! - All features are now implemented!